It all started with Thomas Knauer‘s Quilt Design Coloring Workbook. The small group in my modern quilt guild that focuses on design was working on some of the starters. One in the ‘Chance and Intuition in Modern Art’ suggested seeing how many shapes we could make by drawing 9 lines. 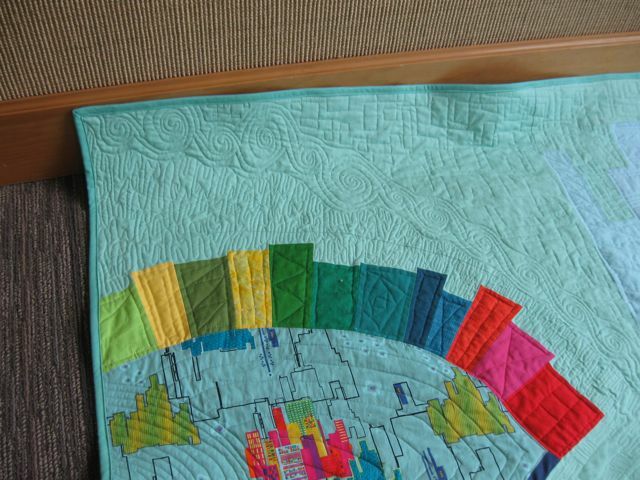 One member made a block using 9 cuts of random fabrics. From that the idea morphed to make a group quilt. Each would have two fat quarters of the same fabric, one a background color and one a print. Each would add a third coordinating fat quarter of their choice. Basically we would make a cut, then shift top fabric to bottom on one piece, then either cut again or seam. Eight times. We saved the 9th for when we would get together. Here are my three blocks. We had a sew day yesterday. I wish I had thought to get a photo of each person’s blocks; however, we were too into next step planning. We set aside one of each set to keep whole, then piled two stacks of three and one of four and made the 9th cut, shifted one piece and added small insert strips of accent colors. We did this to better distribute the colors. Next we had a discussion of whether to trim to standard squares the size of the longest possible edge on the smallest block or to trim each block’s four sides to the largest they could be. We did the latter. Here is an early layout. Of course much rearranging followed. And since the blocks were not all the same size, much measuring as well. We added varying amounts of blue on the sides of each block and blue wherever it was needed to get to a straight seam across. And here is the top, all but the final border to get it to twin size. It was quite fun. If you plan to try something similar, be forewarned that it took a lot of time. We started at 10ish, took a lunch break, and packed up a little after 6. Early on we had two sewing machines, then three. But often we had to wait to see a row before making final decisions on the next row. Or a third seam couldn’t be sewn till we got a piece back from its second seam. We used some of the waiting time for math but some was just waiting. 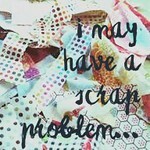 I’ll be linking with Ad Hoc Improv Quilters and Tuesday Colour Linky Party (buttons in sidebar). I had barely stopped typing the previous post until I started arranging the curves. Here is the first attempt. It looked hodge-podgey, especially the larger wedges. And I did give some thought to the placement of the darker red–sewing was too challenging. To sew more wedges or rearrange? Rearranging won, and after some tweaking, a second try–pretty close to the final version. 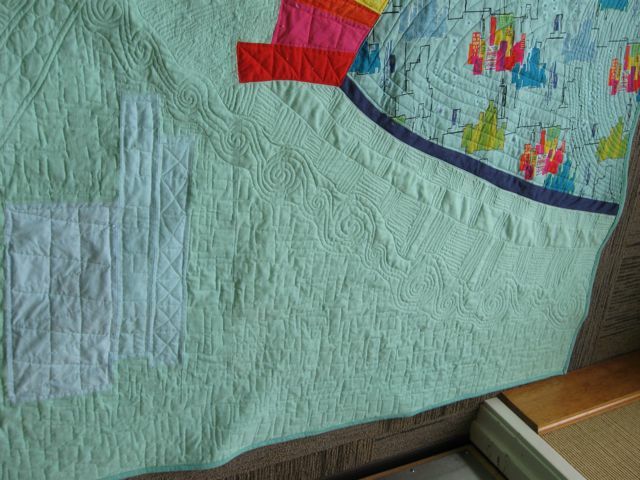 I solved the awkward ends by continuing the wedges with print instead of background, top left and bottom right in this view (which is the quilt on its side). In the future I think I’d save large wedges for a larger quilt, and I’d make twice as many wedges as I’d think I wanted. It is easier to pull out extras and use them somewhere else than to shift from arranging back to sewing. Even though I’d not attached all of them, the chunks I’d sewn needed some pieces ripped off and other chunks were in need of pieces being added. No way to tell in advance. I spent some time pondering the order to sew. I located long, doable curves without Y-seams. Then started assembling the smaller pieces into units that made up the curves. SLW suggests appliquéing the larger curves, but I prefer piecing. So far none of the curves has been too hard to piece. I had more trouble with the smaller, sharper curves. I had planned to bind with the background fabric; however, I don’t think I’ll have enough large pieces–maybe not even enough small pieces to add up to 250 inches. I have a darker teal and a couple reds in the Riley Blake confetti cottons, the required solids. I can think about the choice while finishing the piecing and while quilting. You can make suggestions if you like. Whether I use suggestions or not, I always enjoy exploring options. Linking with Needle and Thread Thursday and Finished or Not Friday (buttons in sidebar). I finished the top last night around midnight; that left this morning to transform the studio back into an apartment and wash the dishes that had piled up while I frantically sewed. 50 x 70 — irregular edge and teal binding planned. Orientation is sideways–blue is the top. Product people can stop reading here. Process people, for you I remembered a couple before and after photos. When I started working on the blue section, I thought it was getting too checkerboardy. So I scrambled to make some combination blocks more like among the reds here. That turned out to be overcompensation and way too dark. So I tried rearranging. I liked that till I sat with it a bit, then the long filler lines on each side of the remaining dark segment distracted me. The solution–shifting left and adding mixed light and dark. While there are still some checkerboard moments, they seem less obvious with variety around them and among more colors. Finally I was ready to move on. In each case there was a lot of piecing I’d not want to lose by straight cutting; nor could I move the segment in farther. There was some aspect I needed where it was placed. So I’ll be using an irregular edge. How tired am I and how tired of trimming and sewing curves? Will a straight cut obliterate a great pieced detail? Does the potential curve enhance the overall look? While the first question is primary, the next three can override it. Most of the curves are gentle. I learned some things about trimming. It is easier if the pattern piece is placed to the left and the piece to be cut to the right (I am right handed; left-handed people might reverse this.) And when there are a couple areas with deeper overlap, something to hold onto, it is easier to hold the pieces steady. I did this trimming with scissors as I had trouble cutting through two layers where there were seams with the rotary cutter, and it is harder to re-cut a line without a ruler. Most of my curves turned out smooth. But I also had plenty of practice darting to make corrections. I pretty much pressed where the fabric wanted to go and then returned to the sewing machine and sewed along the fold where it differed from the seam. No ripping involved because curves require pressing to the side. One other thing I learned. Large chunks of fabric “control” how the square segments are sized and sewn. I had to eliminate a lot of large squares of the bright colors. Heavy and dark just didn’t integrate with the print. Are you still reading? Have you run into any design issues like these? I’m bored with sewing, so I’ll take a break and blog a bit. I’d hoped to bring more forward for this Monday’s linky (button in sidebar), but this will have to do. In case you missed it, here is the layout I am working from.Most of the white space in the layout is becoming filler fabric. Now if I were following directions (who, me? ), I’d have one filler color in each main color section. However, since I am using a floating squares background that didn’t work where planned, I have several light colors. (Here is the background in case you missed that post.) Most of my filler is mint green or ice blue, but there are a couple other light neutrals for added interest. You might notice some puckers and slight curves. When cutting without rulers, “squares” are oddly shaped and lines get wiggly. In Improv for Modern Quilters, Sherri Lynn Wood gives two solutions: straighten the line or curve the seam. Though she prefers the latter, I have used both. I’d expected to lose some space due to seam allowances, but the curves take yet more. So I have various sized and colored squares on hand to fill in spaces. With improv, you are frequently trimming bits of fabric off to make pieces fit together. All those small bits put me into crumb-block mode. I like combining near colors so that they look like one piece from a distance. Break over–thanks for joining me. I’ve been assembling small sections, arranging and rearranging. In the ideal world I’d have before and after photos of the big changes. But I get an idea and jump up to try it with nary a thought of a camera. So, here is where I am now. 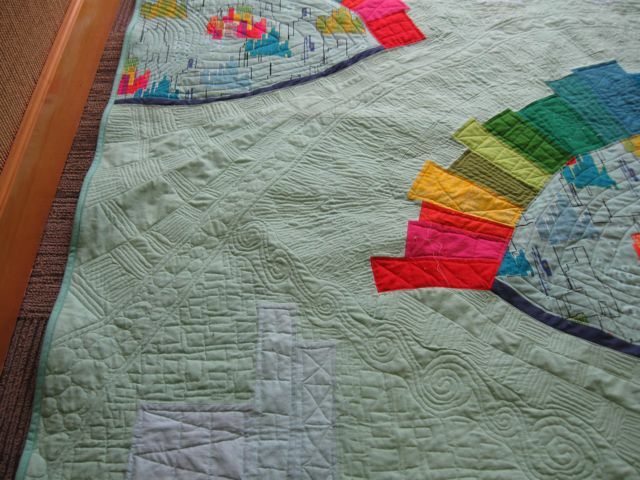 The first unphotographed layout had the bright sections lined up along the Utopia fabric, the greens along the bottom of the middle piece and the reds in a V along the middle and upper pieces. 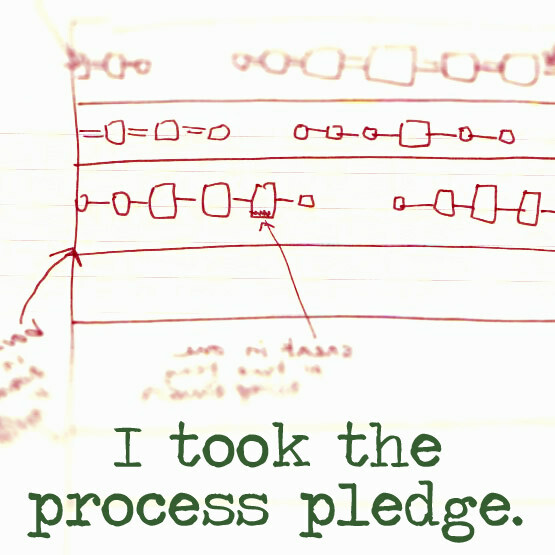 I fiddled and remained unsatisfied until I finally realized that was the big problem. After I realized I needed some larger squares and cut some 8-inch and 10 inch squares I made some rather large sections, but when I placed them, they overpowered the print. So I ripped off the big bright squares, keeping only the big background squares. My approach has been to start with large sections while I have large spaces to fill. Gradually I make smaller and smaller segments–now I am mostly making strips of squares and four-patch combinations. Smaller allows me to fiddle more. You can see there are lots of empty spaces left to fill. I’ve been thinking, Two more days of work, for the last 3 or 4 days. So much for my powers of prediction. One deadline. Guests are coming on the 8th and I’ll need to fold up the ‘design bed.’ And I don’t want anything unattached at that point. has been patiently waiting to be put into a second quilt. And I had a plan. It will be rotated so that the strips are lengthwise, but this is easier to read. My first attempt at Floating Squares (Score #1 in Sherri Lynn Wood’s Improv Handbook for Modern Quilters) was to be the background for the first quilt from the fabric (Skyline), but I didn’t like it for that design, so saved it for this next one. Blue was going to be the filler color, but I ended up liking the mint green better. That is easy enough to adjust. So, according to plan, this would be extended to become the first (bottom in sketch) strip. ETA This photo reminded me of this piece, which did not show up in the WIP pile, so I went on a hunt. I have tried many places, logical and illogical, but no sitings yet. I’m guessing it got swooped up when I was putting some other fabric away and it will be years before I see it again. Sigh. They would have either plain background between them or more floating squares. Then a row of strings (Score #2) based on the bright colors in the fabric, then the fabric piece and another row of strings before the last background row. First problem. 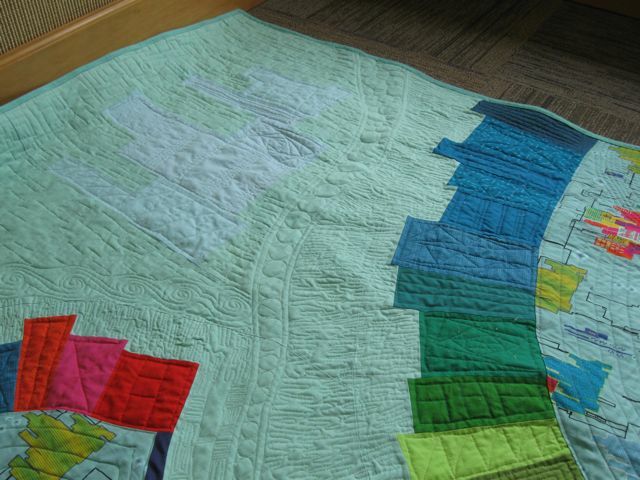 In the left overs, I didn’t have a piece of the Utopia fabric 20 x 70–neither wide enough nor long enough. A lot of mental quilt designing followed that realization, but nothing felt right. So it sat and I did other projects and read books galore–not all were worth blogging about. Then an idea. Abandon rows. Abandon strings. Maybe abandon flowers. Just do Floating Squares intermingled with large squares of Utopia. To that end I worked this afternoon. And this is what I have to show for it. Not much to show for an afternoon of work. But you can see each of the three color combinations. Sherri suggests limiting palette–I modified that. Where she says two fabrics plus a filler I said two colors plus a filler (and even the filler is a little bit pieced–the blue and mint). I’m still aiming for 50 x 70. No danger of running out of fabric. Could run out of steam, though. Or really feel that the design says, “No more.” Time will tell. I’ll be linking with Moving It Forward Monday (button in sidebar). Even though it is a design floor, linking with Design Wall Monday. 6/28/16 ETA: The time is right–linking with AHIQ (button in sidebar). With this finish, my three for the local show are completed. Two days before the deadline! The light wasn’t perfect, but good enough for some photos. I’ll take more when it comes back home. Or at the show. A hanging photo instead of a floor photo, what a concept. 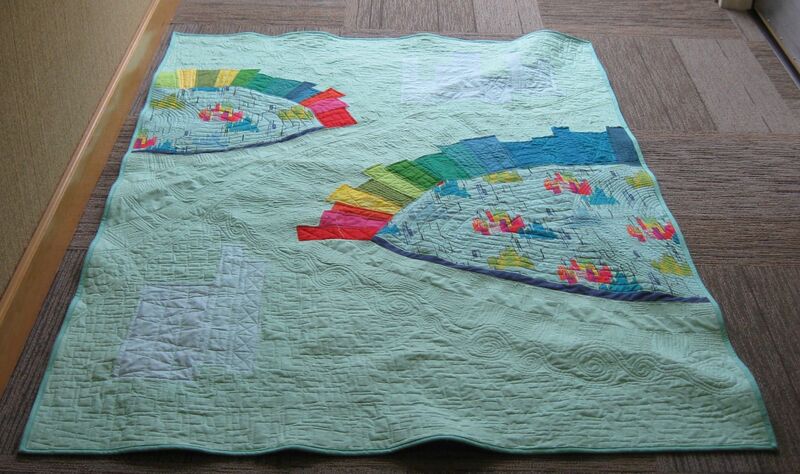 This was my first attempt at quilting large sections of negative space. I’m not totally unhappy with the results, but there are some changes for future quilts. I really like the “cobblestone path” as a divider and wish I’d used it in all three dividing places. The chain of spirals with echoes ends up looking too much like roses and breaks the feel of the rest of the quilt. However, they are fun to make. And when I use spirals again, I’ll have some tight quilting next to them so they puff out more. And I am not sure there is enough contrasting texture between the various sections–circuit board, elongated meander, and waves of checkerboard–someday I’ll learn the real name–and within the “building silhouette” section between the circuit board background and the “silhouette.” I have trouble planning quilting because I can’t quite see it in my head, and even less so in a sketch. I guess all I can do is quilt a lot and get a better sense of what motifs look like by doing. There were a few tucks and puffs, but nothing like were in the last quilt. A big part of that was the batting. But here I also did all quilting from the center out, even when it meant wadding 3/4 of the quilt under the sewing machine harp. Even the long dividing line of cobblestone path. I did have to mark it since I’d not be able to see the whole quilt as I stitched. One more sideways view–not so dramatic a difference as the last quilt, but oh well . . .I like photos. 5/24/16. ETA Linking with AHIQ since the technique is improv even though the design came first. And the quilting is improv. 7/5/16 Edited to add a hanging view of the whole quilt. The photo I took at the quilt show wasn’t good enough, but here is one from guild’s May meeting Show ‘n Tell–about 2/3 down the page.